In late 2018, NYAGI was invited to Haiti to help teach ultrasound as part of Project Santé, a country wide program to improve healthcare in Haiti. By January 2019, a group of almost 30 sonographers, physicians, medical students, medical assistants, and other volunteers had been assembled and was headed to Port-au-Prince. NYAGI Founder and ultrasound champion, Dr. Cliff Gronseth, still wide awake and still advocating for ultrasound after the packed, delayed, overnight flight from Denver to Miami en route to Port-au-Prince, Haiti. The first day in Haiti focused on basic introductions and an overview of the many different uses for ultrasound. Over 40 Haitian doctors, nurses, and other healthcare workers joined the NYAGI team along with representatives from our hosts, the Caris Foundation and a half dozen sonographers working with the International Foundation for Sonography Education and Research and ultrasound equipment distributors, Universal Diagnostic Solutions (UDS). NYAGI founder and ultrasound champion, Dr. Cliff Gronseth, also outlined the training program for the week, including some of the science of learning behind the NYAGI approach and his goal that Haiti become a global example for incorporating lifesaving ultrasound into their healthcare system country-wide. Pamela Brower, President of International Foundation for Sonography Education and Research (IFSER), presenting an overview of ultrasound to over 40 Haitian healthcare professionals. Left to right: Pierre Esperandieu, Dr. Cliff Gronseth (founder, NYAGI), Pamela Brower (President, International Foundation for Sonography Education and Research), Christopher Harmon (Vice President, Caris Foundation), and James Warren (Director of Sales, UDS). NYAGI volunteers, Codee Champney (left) and Dan Coates (center), introduce a group of Haitian doctors to the new ultrasound machines as part of the first day’s technical orientation. Traffic in Port-au-Prince is unbelievable in every sense of the word. Unbelievable that there can be so many cars with places to go. And unbelievable that one can actually get anywhere navigating through it all! The NYAGI approach can be summarized into three steps, the first of which includes intensive, hands-on training in the basics of ultrasound. For the next four days, camped out at Grace Children’s Hospital in Port-au-Prince, the NYAGI and IFSER teams worked alongside the 43 Haitian healthcare providers, teaching everything from knobology and how to set up and adjust the machines to the finer points of creating proper diagnostic images from their scans. OB/GYN, abdomen, breast, and vascular sonographer, Justine Campbell, helps guide Thony Voltaire’s probe to find the patient’s baby. For most of the patients, and even many of the healthcare providers, this is the first time they’re seeing inside the body with ultrasound. NYAGI volunteers, Rachel Ledesma (left), with Chris Paris (middle) and Kevin Xie (right), enjoying doctor jokes in between juggling the 500 or so patients NYAGI and the Haitian doctors practiced on throughout the week. Dr. Cliff, NYAGI founder and ultrasound champion, uses 7D Imaging’s mskNAV software to show a Haitian doctor what she should be looking for in a knee. The second step in NYAGI’s approach is special to NYAGI—and critical for teaching ultrasound—and is the incorporation of 7D Imaging’s NAV™ software suite. The NAV software is a mobile learning and interactive reference ‘EdTech’ platform for continued skills enhancement. Alongside the hands-on learning that participants were getting from NYAGI’s expert sonographers, other NYAGI volunteers were teaching how to use the Apple iPad®-based software. NYAGI volunteer, Leah Rotenbakh, points out an example image in the 7D Imaging NAV software while a Haitian doctor tries to find the corresponding image in his patient’s abdomen. Throughout the week, the NYAGI team was able to shift their training to do less hands-on showing and more hands-off supporting of the Haitian doctors. Part of the goal is that by the end of the week doctors know the machines and basic techniques well enough that, with the references available in the NAV software, they are able to find what they are looking for on their own and to make proper diagnostic images. This ability to continue to develop their skills and learn without requiring the constant—also expensive and impractical—input from visiting experts is key to the NYAGI approach. International OB/GYN, sonographer, and NYAGI veteran, Alecia Martin-Hirsel, steps aside as her group of Haitian doctors and nurses take over the probe, exploring and teaching themselves and each other. 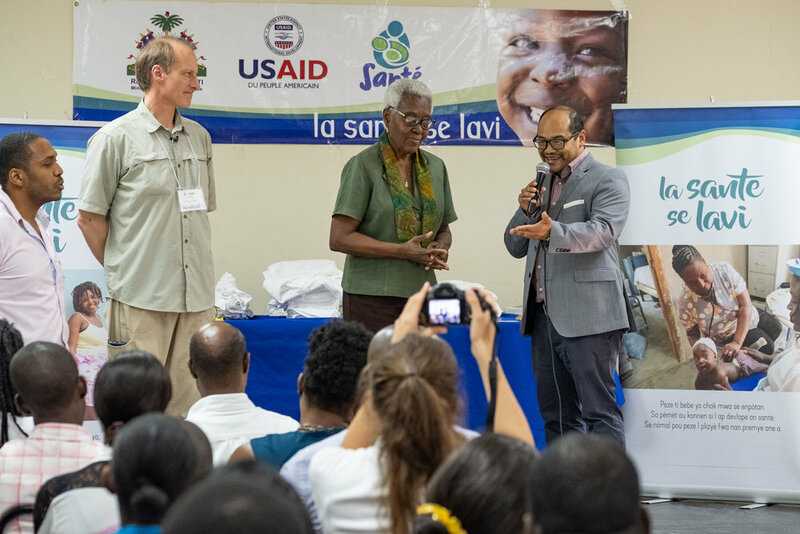 The week of hands-on training and education in the NAV software suite wrapped up at Grace Children’s Hospital in Port-au-Prince with a certificate awards ceremony. 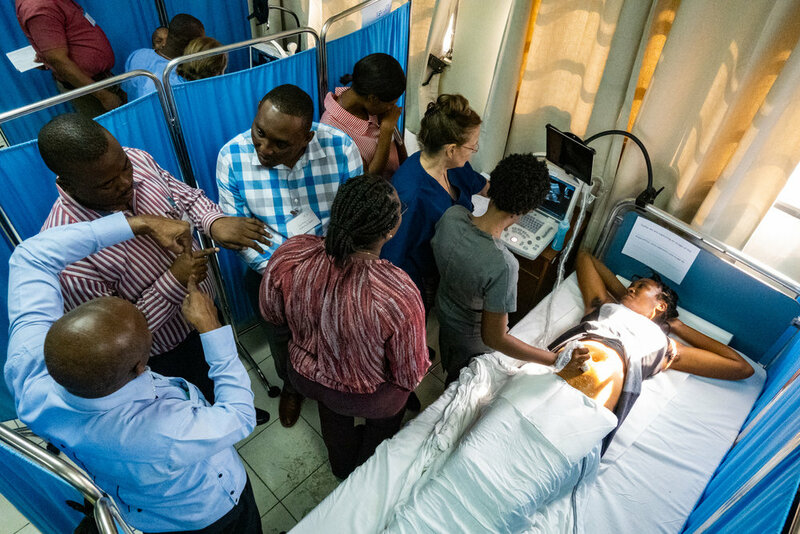 The 43 doctors, nurses, and midwives will return with the 20 machines provided by the Caris Foundation back to their hospitals and clinics armed with basic training and the 7D Imaging NAV software suite on an Apple iPad to begin using ultrasound to save lives. Dr. Nat Segaren, Medical Director for the Caris Foundation, addresses the doctors and congratulates them on their accomplishments over the week of training. Certificates and t-shirts are handed out to each participant by the NYAGI team. It’s a wrap! And a big group selfie! On the last day in Haiti, the team visited a rural clinic just outside Port-au-Prince that serves two local communities. It was a great opportunity for the whole NYAGI team to get out of the hospital (and hotel!) and see the conditions in which many in Haiti live. NYAGI volunteer, Becca Makens, with kids outside a new community center being built in Chambrun, just outside Port-au-Prince, Haiti. Haiti is the poorest country in the Americas and has suffered multiple natural disasters including hurricanes and earthquakes in recent years. And as we saw in the news just before and just after our visit, they are also struggling with political corruption and the social instability that all of these unimaginable pressures put on a resource-limited country like Haiti. Still, with help from organizations such as the Caris Foundation, Catholic Medical Mission Board, and the Haitian Health Foundation through the USAID-funded Project Santé, and the simple good will of everyday Haitian people like the 43 doctors who participated in NYAGI’s training this past week, there’s hope. There always is, and NYAGI exists because we believe that. Casse, about 4 hours into the central plateau from Port-au-Prince, is typical of the rural towns across the Haitian countryside. Photographer Jason Houston and videographer Justin Simpkins stayed on after the rest of the team left back to the United States, to travel back with several doctors to their clinics and see their ultrasound machines set up and scanning for the first time. The final step in the NYAGI approach is continued learning, both through the 7D Imaging NAV software and through options such as remote webinars with NYAGI sonographers back in the United States. Dr. Arold Scutt, Medical Director of Centre Médico-Social Petite Place Cazeau since 1991, sets up his new ultrasound machine for the first time. He expects to retire in the next year or two and is proud he was able to add this life-saving technology to his legacy. Dr. Darline Molin Dol, Medical Director of the Project Medishare Centre de Santé/Maternite de Lahoye started sharing her new knowledge and teaching her nurses with her very first scan. She also shows them how to use the 7D Imaging NAV software as an ongoing resource providing tools for continued self-learning.